It's likely that most of us have heard the phrase “poor planning = poor performance” or “fail to plan – plan to fail” and other variations on the same theme. What it all boils down to is that the success of any plan, process, initiative, project, etc, is usually determined by the quality of the planning process. This is particularly true and vitally important in terms of Projects. I’m sure you’ll agree that, amongst other aspects, the up-front planning stage of a project (or a series of related tasks e.g. arising out of a meeting) the “Why?” “What?” “Who?” “When?” and “How?” of the initial planning stage, need be clearly identified, effectively captured, clearly understood and well communicated. Negative knock-on effects for staff, the business – and customers! The Map below depicts one of our views on "planning for success" in project work and project management in general. I am confident that, as MindGenius users you are increasing your chances of project success through effective deployment and use of MindGenius – not only at the critical front-end, but through the whole project lifecycle. An informative “Did You Know?” section – highlighting a strong benefit-rich feature within MindGenius and indicating possible application and use. We have also started an equally interesting and user-focussed “How To...” section – taking a useful MindGenius function and explaining how it works, why you would use it and what benefits it provides. Both of this month’s “Did You Know?” and “How To...” articles have relevance to “Projects – Planning for Success”, I do hope that you enjoy them and find them practical, thought-provoking and useful. The success of Projects is largely down to the success of that crucial front-end planning stage. 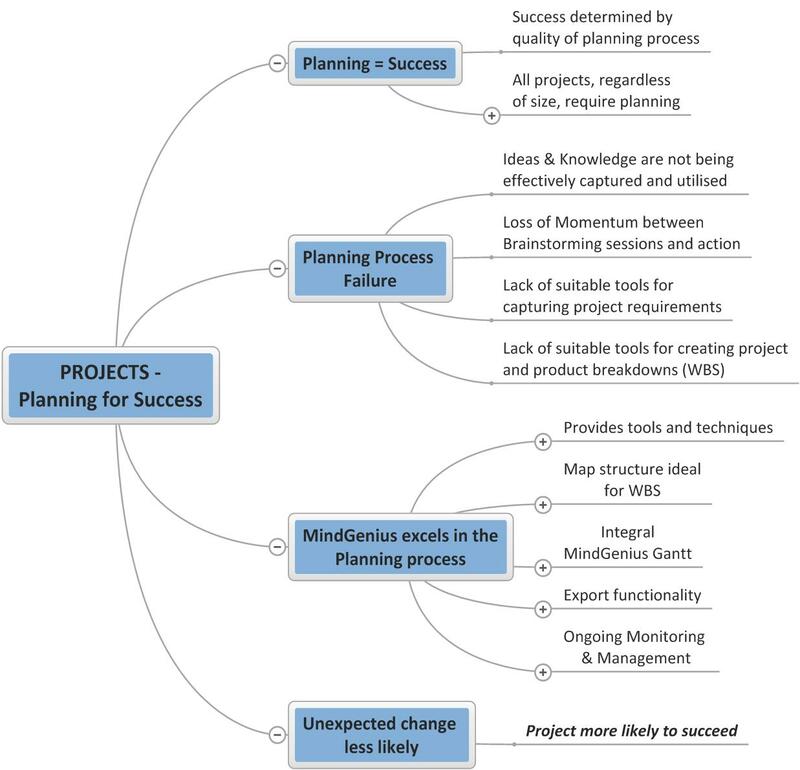 MindGenius provides a highly effective methodology for capturing, visualizing and structuring project requirements (WBS). This short but informative course shows you how to plan for a successful project. Are you getting the best out of MindGenius for that all-important scoping and planning stage of a project? Used correctly, MindGenius enables easy, quick and efficient capture of all the necessary requirements and brings an engaging, collaborative and highly visual dynamic to all project planning activities. Our short 30 minute live online training session, hosted by Head of Client Development Jamie MacDonald, will take you through the fundamentals of using MindGenius to improve on the effective use of MindGenius at the crucial front-end planning stage of a Project, ensuring that you “plan for success”. Cost: £50 / €60 / $80* per session. This training session is scheduled for: Wednesday 5th March at 16.00 GMT, 11.00 EST. For the first of our new series of bite-size “How To’s”, we will share knowledge and hints and tips on how to use Map Explorer. The Map Explorer is unique to MindGenius and facilitates the navigation of large maps, allowing you to move quickly between the high level and detailed views of mapped knowledge, topics, projects, etc, without having to create a series of linked maps. Where will I find Map Explorer? Map Explorer is located in the Property Pane on the left-hand side of the MindGenius screen, below the File menu. How best can I use Map Explorer? The structure within Map Explorer is automatically created as you build your map. The structure within Map Explorer replicates the structure and hierarchy of the map. Expand and collapse the sections to drill up and down through your map. Selecting a branch topic in Map Explorer makes that branch the focus in the main window. The map view changes to show a new map with the selected branch as the core, allowing you to focus and add further ideas knowledge and information. What are the benefits of using Map Explorer? Welcome to the first of our new “Did You Know?” Newsletter articles. This is the first of a regular series of informative, practical “bite-size” articles covering important MindGenius features and highlighting application and use. MindGenius has an integrated Gantt View. No need for other tools – from planning to scheduling, through to delivery!